AOS Graduation with guest speaker Laurence Geller held in the Marriott Pavillion on The Culinary Institute of America’s New York campus. 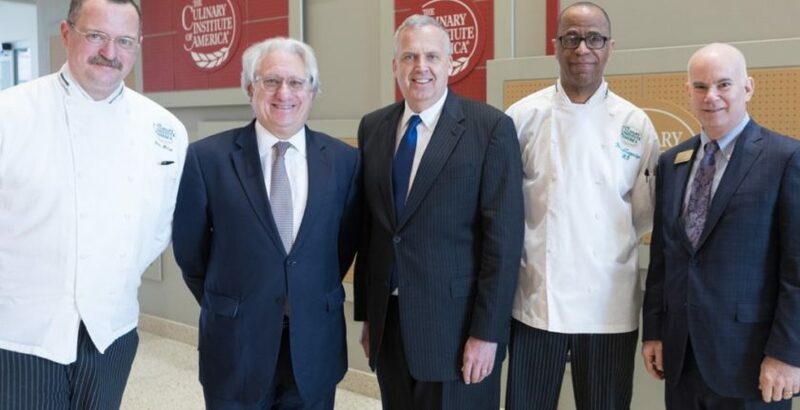 Laurence Geller CBE, chairman of Innovative Aged Care, and founder of the Chelsea Court Place luxury care home in London, has been appointed ambassador of the Culinary Institute of America (CIA). With campuses in New York, California, Texas and Singapore, the CIA is dedicated to providing the world’s best culinary education. Laurence is passionate about food and has enjoyed a rich career in the hospitality industry, having started his career as a chef in the kitchens of the Connaught Hotel, London and later going on to own restaurants with prestigious chefs such as Alain Ducasse, Michael Mina, Gordon Ramsey, Richard Sandoval and Jason Atherton. Laurence now applies his gastronomic knowledge, experience and passion at Chelsea Court Place, where he provides leadership and direction to the hospitality team. Chelsea Court Place was founded in 2016 by Innovative Aged Care with the vision of delivering bespoke dementia-focused, premium care homes and day services and to help shape the future of memory care services (see EXCLUSIVE: Luxury home pioneers bespoke dementia care).